If you’re like me, you’ve spent the majority of your career to date as a “traditional” marketer. Meaning that your days have been spent executing a wide range of marketing tactics…everything from copywriting to event planning to public relations to advertising. These tactics supported the overall strategy of the marketing department and the organization with the end goal of creating awareness and driving sales. Today marketing is much different than it was even five years ago. It’s not even referred to the same way. We have content marketing, inbound marketing and digital marketing…just to name a few. And to complicate things further, much of the marketing conversation now revolves around demand generation. Subscribe to The Demand Generation Show today to learn insights and tips from the experts that will help you be a demand generation super hero. At Imagine, we talk about demand generation a lot. In fact, our podcast is called The Demand Generation Show. In episode 2, Doug explained that while there are a wide variety of definitions out there, what it means to us is: The totally aligned, holistic approach to generating interest, transforming the interest to engagement and turning the engagement into revenue. Based on that definition, marketing is clearly a major player in demand generation. If you think about it, isn’t a lot of what we know as traditional marketing really part of a demand generation approach? The answer of course is yes but there are differences. If you want to make the transition from traditional marketer to demand generation super hero, there are some adjustments you need to make. Here are four tips to help you get started. Throughout your career, you have probably been a part of the marketing team and you worked closely with the sales team. And if we’re all honest, that relationship has probably not always been sunshine and rainbows, has it? The first step to becoming a demand generation super hero means dropping the marketing and sales distinction. Demand generation is a holistic approach to revenue creation. It is not sales and it is not marketing. It is a team working together to drive revenue. There will still be roles and responsibilities that fall into the marketing bucket or the sales bucket. The key to keeping the demand generation team on the same page is alignment. Everyone must be working together towards the same goal. Establishing a service level agreement or SLA will clearly define what the goals are and create accountability for the group. If you are serious about demand generation, it’s time to move past the us vs. them mentality where sales and marketing are concerned. Lead your organization to the next level by creating alignment and delivering results. By this time, I’m sure you’re familiar with the marketing funnel. Many people talk in terms of the top of the funnel, middle of the funnel and bottom of the funnel. But what about above the funnel? 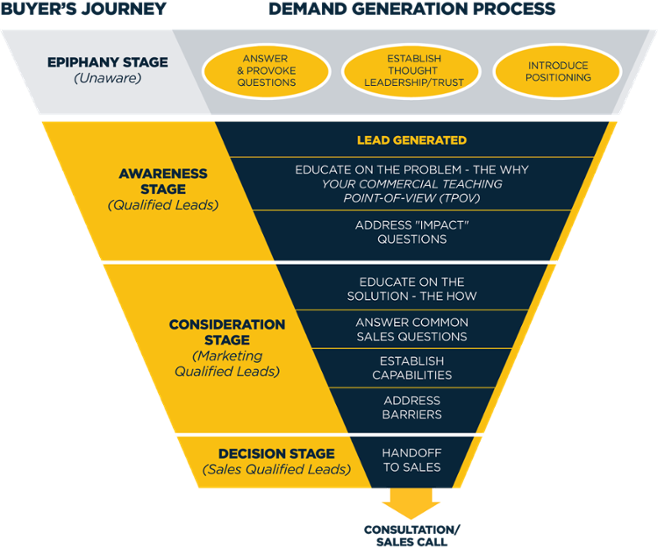 Demand generation begins above the funnel. If you want to be successful, your approach needs to begin before a lead even enters the funnel. In the graphic below, we’ve defined the demand generation funnel. We call the stage above the funnel, the epiphany stage. At any given point in time, 85-95% of any market is in the epiphany stage. They are unaware. They are not thinking about the issues your product or service impacts or they believe they are happy with what they have. What demand generation super heroes know is that they need to connect with prospects while they are in this phase. Go back to your buyer personas and create content - in a variety of formats - that answers the questions they’re thinking about and provokes more. Also, begin to establish thought leadership and introduce your positioning. If you are able to cause an epiphany for someone, they are more likely to seek more answers from you and eventually become your customer. Remember our definition of demand generation? One of the key words is holistic. That means successful demand generation does not rely on a single group of tactics. Instead it ties together and aligns all of the tactics involved in revenue creation. For example, at Imagine, we take an inbound marketing approach. That doesn’t mean we ONLY use inbound marketing tactics to drive revenue. We also use outbound tactics, events and PR. If you want a successful demand generation strategy, get out of your silo. Evaluate and build a process that includes inbound, sales development, events and any other tactics that will help you create revenue. For a long time, it was difficult to provide evidence that marketing tactics were really having an impact. Print ads, for example, were designed to create awareness but there was no real way to measure how much awareness they were creating or how that was impacting revenue. 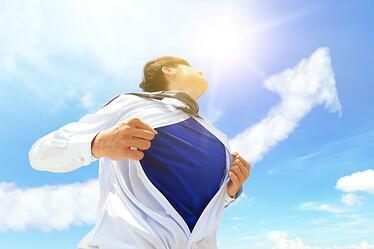 Demand generation super heroes are results focused. At the end of the day, the goal of the entire strategy is to generate revenue. If that is not happening, the strategy needs to be adjusted. Identify the metrics that will help you keep your strategy on track and report on those metrics to leadership on a regular basis. The SLA we talked about earlier will help you get started. If you are able to demonstrate how your demand generation program is positively impacting revenue, you WILL be a super hero to the leadership team. While traditional marketing and demand generation sound like very different things, the truth is your experience as a traditional marketer has given you a well-established foundation for transitioning to demand generation. A few adjustments to your overall viewpoint and tweaks to your approach will put you well on your way to becoming a demand generation super hero.